Anthony Schaw and Elsa Van Ornum inside the college’s board room. Portland Community College is cultivating future leaders right here in its own backyard. Only in its second year, the Presidential Executive Internship Program is an opportunity for students to work with PCC President Mark Mitsui and his leadership team. The program is individually tailored to the students and their academic and professional interests, and develops around projects they are interested in spearheading. During the internship, they get to shadow the executive office and gain insight into the management of a major educational institution. The 2018-2019 interns are Elsa Van Ornum and Anthony Schaw. Van Ornum and Schaw will work closely with PCC executive leadership, staff, and community members throughout their year-long internship. 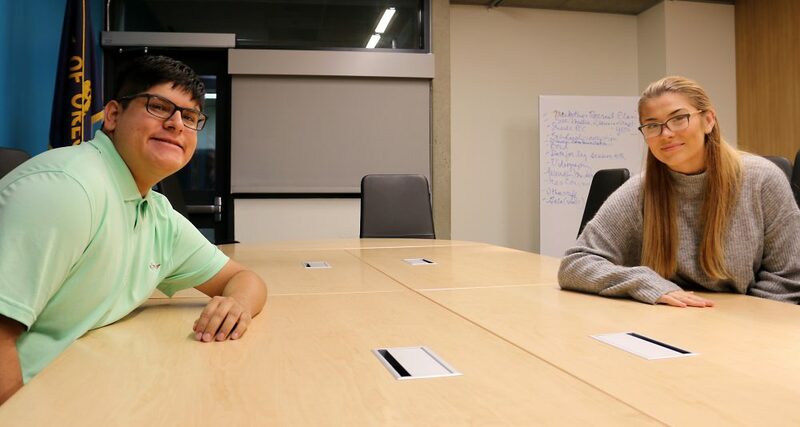 With interests that range from Finance to Human Resources, and sharing a passion for equity and inclusion, the two students are seeking to give back to the college while reaping the benefits of this unique opportunity. For students interested in applying for the 2019-20 internship, contact Mona Dolton at mona.dolton@pcc.edu, or call 971-722-4621. Van Ornum is currently enrolled in her first year at PCC, new to both the college and to Portland. Originally from Seattle, she moved here last year to finish her senior year of high school in Lake Oswego in order to become a student at PCC. She was interested in enrolling because “it stood out in wanting to help students succeed,” she said. With the ultimate goal of becoming a project manager, she is working toward her Associate of Science Oregon Transfer of Business Degree. While in Seattle, she played an important role in bringing the first gender-neutral bathroom to the Seattle School District. She and other student leaders wanted to address the concerns of students who were uncomfortable using gendered restrooms and were being harassed. One of the biggest challenges of this project was communicating to the larger student body the importance of kindness and respect, and appreciating the individual needs of every student. “I highly value kindness and have transformed it into my strongest asset as a leader,” Van Ornum said. She also volunteered with the Seattle Rotary Club to bring Shelter Boxes to families in the Philippines in the aftermath of a natural disaster. She found fundraising harder than she thought it would be, but it came down to the matter of spreading the word. “When people were given the information they needed, they stepped forward and pitched in,” Van Ornum said. She shared that it took a lot of research and coordination to find supplies that would withstand conditions on the ground, but the team was ultimately successful in getting a range of needed supplies to those affected: tents, water purification tablets, and cooking utensils, among other items. “Every day is an opportunity to lead the way to a better future,” she said. Here at PCC, Van Ornum is enjoying the internship and the opportunities she’s had to work closely with college leadership. 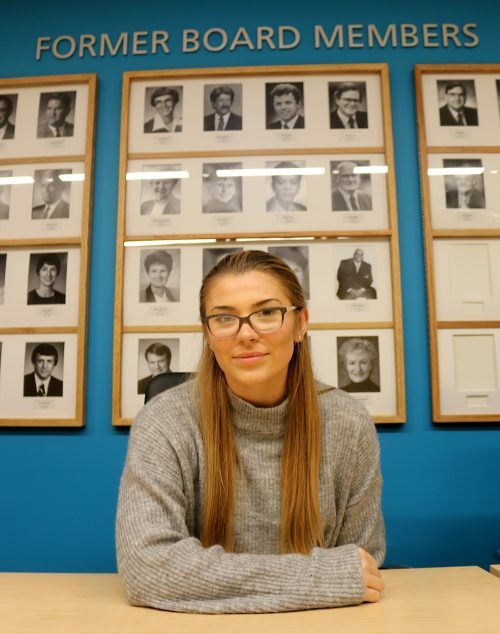 She’s discovered the college president is a more expansive role than she’d originally envisioned. “President Mitsui engages with the community more than I thought. He connects students, staff and faculty to relationships and outside opportunities. It’s really impressive to see how much the people here care,” said Van Ornum. As for her Internship project, she is still developing specifics, but she knows she wants to spread the word about PCC Foundation scholarships. As a student who covers the costs of her classes out of her own pocket, she finds that paying for college is the hardest part of higher education. “There is a lot of confusion and missed opportunities for students, and many are paying more than they should be,” Van Ornum stated. Her goal is to connect students to financial aid resources and work toward fixing the knowledge gap so more are aware of the resources available to them. She would also love for there to be more student support for things like filling out the FAFSA, ORSAA, and OSAC applications. Schaw is in his final year at PCC, taking a range of courses that include Oceanography and Accounting as he works to complete his Associate of Arts Oregon Transfer Degree. He plans on graduating next spring or summer, after which he intends to transfer to a four-year university to complete his Bachelor’s Degree in Business. 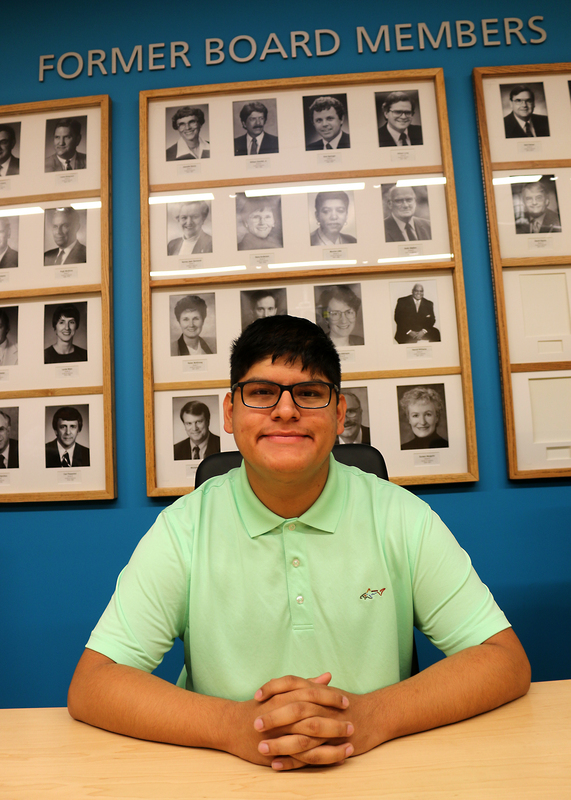 His ultimate goal is to work in a human resources department, where he’d like to develop trainings and programs about diversity, discrimination, inclusion and equity to create an inclusionary and accepting workforce. He’ll be meeting with the college’s Human Resources Vice President Lisa Bledsoe to learn more about how PCC builds respectful and diverse teams. “Respecting others is clearly an important value here at PCC,” Schaw said. This program isn’t his first time as an Intern. Schaw also spent the summer of 2017 interning with the City of Hillsboro, in its Economic Development Department. He helped organize the Hillsboro Tuesday Market and promoted the children’s program, which distributed tokens for kids to enable them to buy fruits and vegetables. “I was impressed by how serious the city and the market were about teaching kids about healthy eating habits,” he said. After his role with Hillsboro, Schaw joined the Rock Creek Campus’ Multicultural Center as part of its Men of Color Achievement Initiative Program for the 2017-2018. He learned about the critical role multicultural centers play in ensuring a welcoming and safe school environment for students of color. As a coach and mentor, he worked with high school students of color to demystify the college process, helping them understand the academic and financial aspects of higher education. He has particularly enjoyed how approachable the leadership at PCC has been. But he has been really encouraged by the warm approach of Mitsui, Sylvia Kelley (executive vice president), and Chris Villa (Rock Creek Campus president). While balancing his coursework and his responsibilities as a Presidential Executive Intern this year, Schaw is also excited about making the trip to Salem to lobby on behalf of the college, which is seeking funds for increased student support this legislative session. Emma Kallaway, PCC’s government relations director, has been working with both Ornum and Schaw to teach them about how the college administration interacts with government.